Gold Medal and a Certificate of Merit for standing first in all India D.C.H. Examination held by the College of Physicians and Surgeons in April 1980. 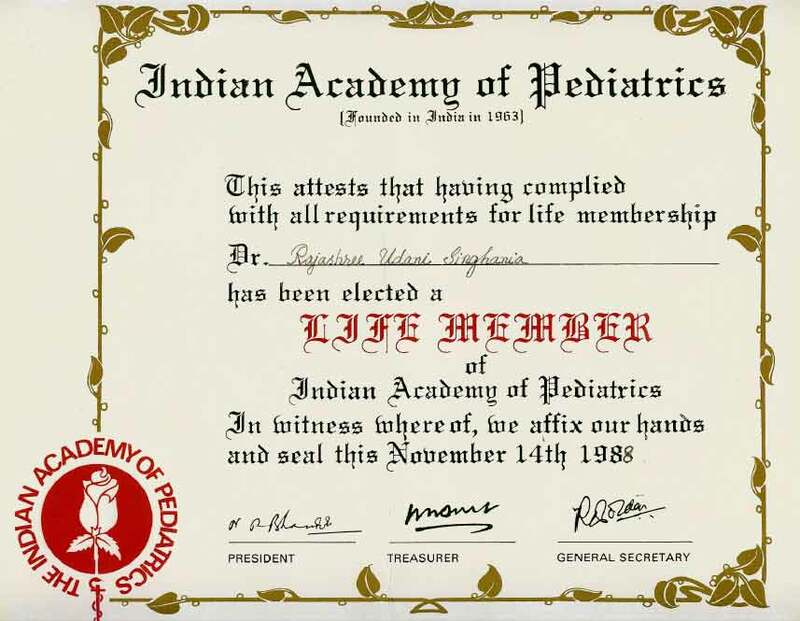 Gold Medal for standing first in MD Paediatrics Examination of the University of Bombay, December 1980. Organized State Level Rajasthan Paediatric Conference in Kota, December 1986. State level Neonatology Conference, Kota, February 1990. Resuscitation Training workshops – Rajasthan, 1990 – 1994. Official correspondent of International social service Geneva 2009-present. Observer in the following centers in the United States of America for a period of six months-January 1981 to June 1981. Neonatology & General Paediatrics, University of Virginia. Hospital, Charlottesville, Virginia under Dr. Kattwinkle. Child Development, Rose Kennedy Center, Albert Einstein Medical Center & Hospital, New York. 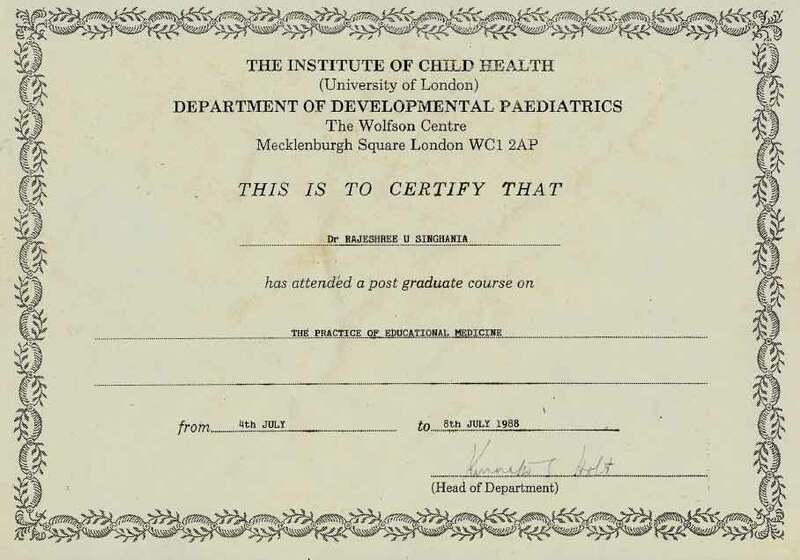 Certificate in Munich Functional Diagnostic and English Language therapy, Deutsch Gesellschaft fur Sozialpadiatre E.V, Germany, 1982. Munich Kinderzentrum Training in Neurodevelopmental testing by Vojta Technique in Munich function Diagnostic Test, July 1982 to August 1982, May 1983 to June 1983 (4 months). 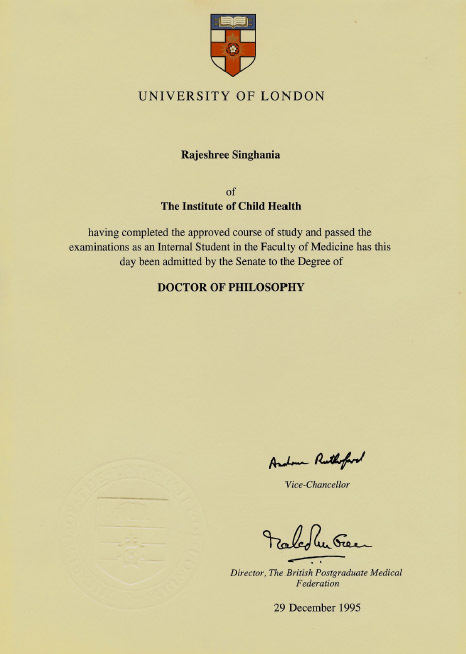 Dr. Singhania has contributed enormously to the world of Special Needs and is one of the few Pediatric Doctors in Dubai who deals with ADHD and Autism. She has seen over 6,000 patients in Dubai and has worked with families from over 50 nationalities and cultures. 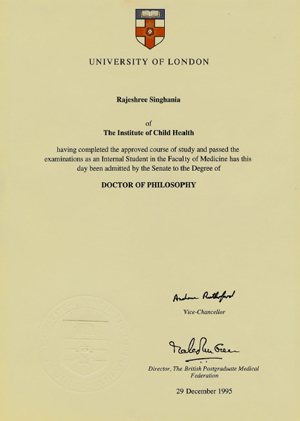 Dr. Singhania elevated the evaluation of special children to international levels. She started a school for Special Needs Children in India and created rural development programs to improve children’s language. She was also the head of the Pediatric department at a General Hospital in India. 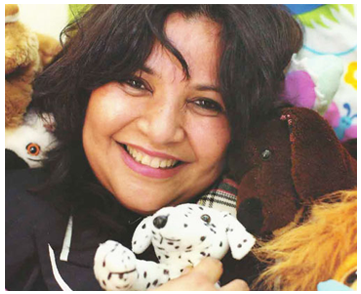 Dr. Rajeshree Singhania is a voluntary member of the International Social Services, Geneva and helps children of families with problems across the border. She has conducted several workshops and training programs in Dubai on ADHD/ADD and Autism both for parents and professionals and she has presented papers on ADHD and Autism in national and international conferences in the UK, UAE, and India. If you like what you have seen or read about the pediatric doctor Dubai, please share it with your friends by clicking on one of the social media buttons below.